Project Learning Tree and the University of Florida developed this secondary module to help educators in the Southeast teach about climate change impacts on forest ecosystems, the role of forests in sequestering carbon, and strategies for reducing greenhouse gas emissions and adapting to changing climatic conditions. The module explores these concepts in 14 experiential activities by using research related to the goals of PINEMAP—a regional research, education, and extension program focused on southern pine management and climate change. 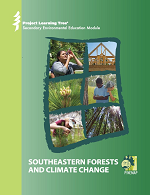 Select Access Free PLT Curriculum to go to the Southeastern Forests and Climate Change website. The Southeastern Forests and Climate Change website includes the lessons outlined below, along with tools and resources to support you in using this content with your students. There is also a PDF of the entire module that you can download. The activity provides an overview of the connections between forests and climate. Students create a timeline of climate science over the past 200 years and gather information from U.S. Forest Service video about climate mitigation and adaptation strategies for forests. Students learn about the scientific evidence supporting climate change, use this information to evaluate and improve conclusions some people might draw about climate change, and participate in a role-play to negotiate solutions. Through this activity, students explore the nature of science and better understand why there are various perspectives about climate changes. Students use the online resources, the Climate Change Atlas from the US Forest Service to explain the effects of climate change on the future distribution of suitable habitats for forest types, tree species, and bird species in the southeastern US. In small groups, students learn about research that is helping forest managers monitor and respond to climate change using new tools and management techniques. This activity allows students to explore the connection between forests, climate change impacts and management strategies for creating resilient forests. Students draw these connections in a system diagram, a tool that helps them see the system. Students use growth data from loblolly pine forests to identify genetically different populations and project where trees with certain characteristics are likely to thrive in changing climatic conditions. Students imagine they are a carbon atom and take part in a simulation that allows them to cycle through biological and physical systems. Group work and class discussions allow students to better understand carbon pools, quantities, fluxes, and residence time–with an emphasis on how human activities can affect where carbon goes. By performing a play through group presentations, students investigate life cycle assessment (LCA) data for three types of outdoor dining furniture (plastic resin, cast aluminum, and pine) and make conclusions about relative impact of the products on global climate change. After a debate where students compare products, students develop a set of life cycle questions that con be used to guide their consumer choices. In this group activity, students assess a series of facts to understand how to manage a plantation forests to maximize the removal of atmospheric carbon as they practice cooperative learning and graph interpretation skills. Student teams review what they have learned in this module by compiling a report of the future of forests in Southeast US. Students can share their knowledge by writing a letter to their state or county forester, city arborist, a local newspaper, community leaders, or other audiences that are relevant in your area. This activity provides guidance for students to plan an environmental action project related to forests and climate change solutions in their community.